No matter what they did on defense, the Sandy girls basketball team just had no answer for St. Helens' Maddie Holm. The sophomore forward posted a game-high 28 points to lead the Lions to a 50-43 victory over the Pioneers at St. Helens High School on Friday night. "My teammates did a good job of spreading the floor and getting the ball to me when I was in the open spot," Holm said. "As a coaching staff, we always try to put our players in positions where they can be the most successful," St. Helens coach Brittaney Niebergall said. "Whenever we saw a place where Myranda (Northrop) and Maddie could get to the hoop and finish, we were going to put them there." With the win, 27th-ranked St. Helens improved to 5-7 in Northwest Oregon Conference play and 9-13 overall. For Sandy, Friday's result marked a third straight loss and dropped the No. 30 Pioneers' NWOC record to 2-10 (5-17 overall). The fact that the Pioneers were able to compete for the entire contest — they lost 46-28 at St. Helens back on Jan. 19 — was a moral victory for Sandy head coach Nechele Bradshaw and this young Sandy squad. "These girls always give it everything they have, no matter what the score is, so I'm proud of that." Bradshaw said. "There is still work to be done, but I'm definitely pleased with how we competed tonight." Sandy guard Isabella Kansala was the only Sandy player in double figures with 12 points. After the game, she talked about the challenge of stopping Holm. "(Holm) is a really solid player," Kansala said. "We tried to stick with her, but she put a lot of good moves on us that we weren't really expecting. It's hard to keep up with a girl that is scoring like that and making tough shots." Sandy jumped out to a 6-0 lead to start the game thanks to 3-pointers by Kansala and Isabelle Cabrera on the first two possessions of the game. However, Holm began to take over moments later. The Lions responded with a 6-0 run of their own on back-to-back hoops from Holm and a transition layup from Northrop, who had 13 points on the night. Holm finished the period with two more buckets to tie the game at 10-10 going into the second quarter. After a three-point play from Holm concluded a 9-0 run in the second period, it looked like St. Helens was on the verge of breaking the game open. But Sandy tightened up defensively and finished the half on an 8-1 run to trim the Lions' lead to 20-18 at halftime. While Holm was the aggressor for most of the first half, it was Northrop that took over in the third quarter. The senior point guard went off for eight points in the period and went coast-to-coast for buckets on three separate occasions. "I definitely came out after halftime with an aggressive mindset," Northrop said with a smile. "(Niebergall) basically ordered me to take the ball to the rim more." 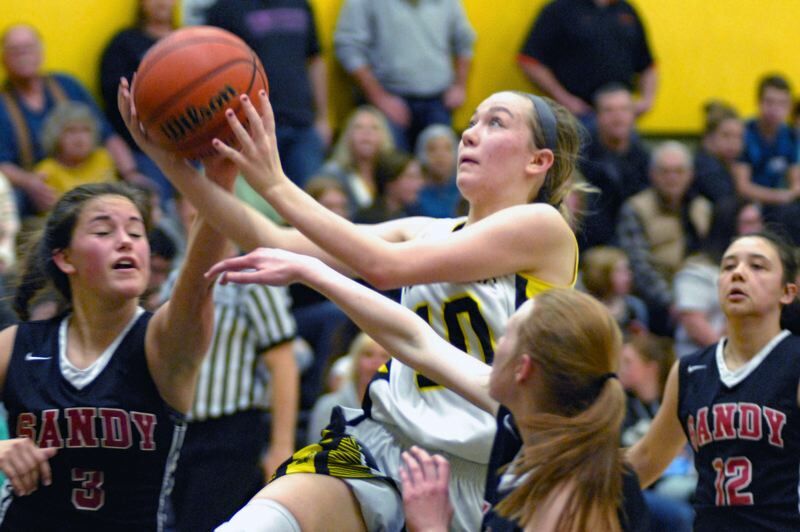 After falling behind by as many as 13 in the fourth quarter, Sandy clawed its way back within 46-38 after consecutive hoops from Kansala and Brooklyn Adams. The Pioneers were looking to get the deficit down to six after getting a big defensive stop with under two minutes left, but Holm picked Kansala's pocket as she crossed midcourt and laid the ball in at the other end to push the advantage back to double-digits. For Sandy, Tana Dwyre added nine points and Alyssa McNutt eight. In upcoming games, St. Helens hosts La Salle at 7:15 p.m. Tuesday, then plays at Wilsonville at 7:15 p.m. Feb. 23.